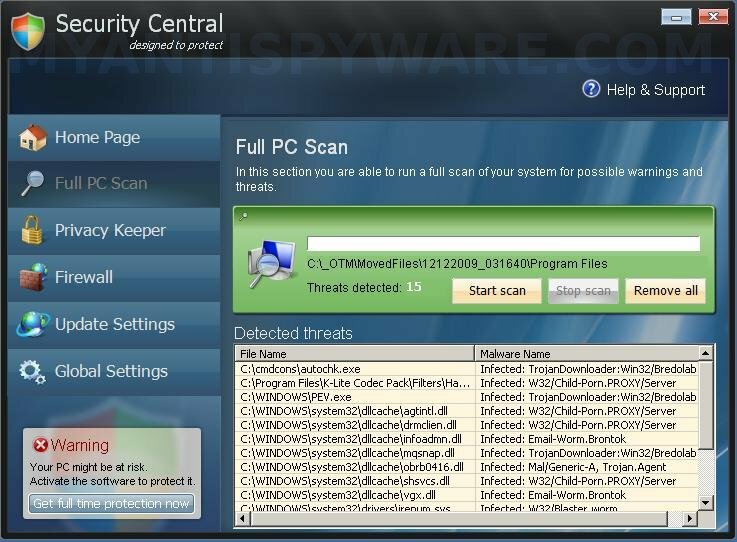 Security Central is a fake security application also known as rogue antispyware program. It usually installed itself onto your computer without your permission and knowledge, through the use trojans which pretend to be flash player updates or even video codecs required to watch a video online. When the trojan is started, it will install Security Central onto your computer. During installation, Security Central will register itself in the Windows registry to run automatically every time when you logon into Windows. Once installed, it will simulate a system scan and label legitimate Windows files as worms, trojans and malware that will not be cured unless you first purchase the program. This is of course nothing more but a scam, all of these “infected” files are clean and the scan results are a fake. So, you can safety ignore all that Security Central gives you. Please activate Security Central to protect your computer. replicate itself if no action is taken. Click here to have your system cleaned by Security Central. suspicious and UNWANTED files on your computer. However, all of these alerts, screens and pop-ups are fake and like false scan results should be ignored! As you can see, Security Central is scam and designed with one purpose to scare you into purchasing so-called “full” version of the program. Do not be fooled into buying the program! 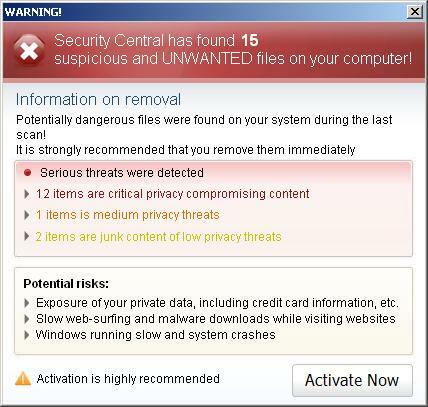 If you are infected with this malware, then use these removal instructions below, which will remove Security Central and any other infections you may have on your computer for free. Once you have selected all entries, you will see a screen similar to the one below. Close all running programs then click once on the “fix checked” button. Close HijackThis. Select Perform Quick Scan, then click Scan, it will start scanning your computer for Security Central infection. This procedure can take some time, so please be patient. Make sure that everything is checked, and click Remove Selected for start Security Central removal process. When disinfection is completed, a log will open in Notepad and you may be prompted to Restart. 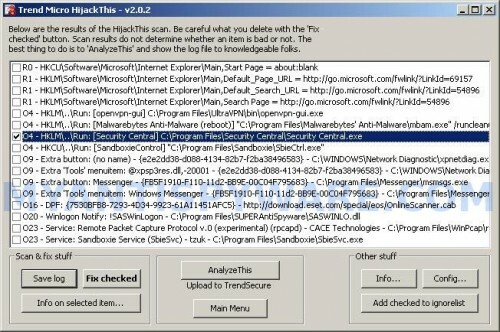 Thank you very much, I removed it security central malware from my PC. Thanks guys, I removed Security Central from my machine. Very straight forward if your advice is followed. Nothing semed to work, then I found the files, folders and that reg key thing. It wouldn’t let me delete them but I could rename them. Afterwards I rebooted, (found my computer was back to normal) found them again and then deleted them. Thanks to this website I was able to fix my problem. Thanks for the info on Security Central. However, it looks like you can get rid of it by starting your computer in Safe Mode (hit F8 when computer is starting if using Windows XP) and restoring to a time before you got the Security Central infection. THANK YOU!!!!! I have installed, un-installed, reloaded multiple versions of other anti-spyware and malware products. This is the first one to remove Security Central. I will definately recommend. Thank you so much. I followed the directions on this site for Security Central and it seems to be working now. Running Malware bytes now and then stinger. Thanks again. Thought I was going to have to do a fresh install. Thanks for the great help !! Easy and straight forward. Developers of this Security Central should be punished severely !! Thank you very much for the guidance provided to remove security central threat. Thank you very much for the guided help and support for enabling in removal of Security Centrsl from my laptop. it is blocking this site now so I can’t download the hijack. What do i do please? I’m gonna give it a try! Hope it works for me..
help! problem is HKLM run security central exe doesn’t appear in the results of HijackThis. What shall I do?